I hope MrSippi likes this picture of me. Mum was playing around with Photoshop again. I wouldn't let her take any new photos of me, you see. I found out this week that my mum and dad are going on another holiday. On Sunday! They are going to New Zealand for 11 days. I don't see why they can't take me too. 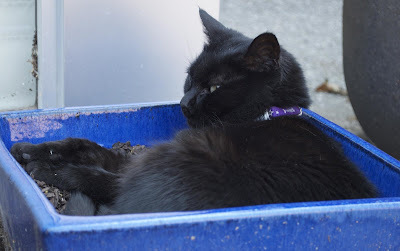 So I am sitting out in the parsley pot, sulking. My grandma and grandpa are going to come and take care of me, which is good, but it's still not fair! 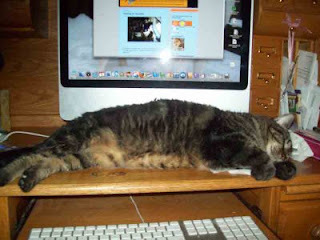 Grandma doesn't know how to help me with my blogging so I won't be able to post, or visit any of my friends! I am not happy. What sort of revenge should I take on mum and dad? My friend Fin has announced the Acatemy Awards, and I am very excited to say that I won for Best Scary Movie Poster! I'm so honoured. I'd like to thank the Acatemy, and Fin for having the competition, and mum for helping me with the poster, and dad for feeding me ham, and MrSippi for being my boyfriendcat, and Zim for being my best friend, and... (music fades in). Please go and vote for me! Or vote for somepup else's design if you prefer, but please vote! 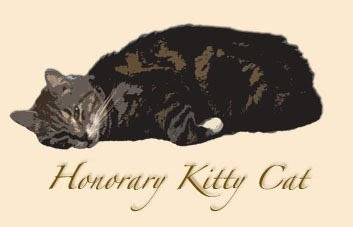 I think I am the only kitty who submitted a design, so I need all the help I can get. My fellow black cat Mr Hendrix asked me: What do you think is the best part about being a House Panther? 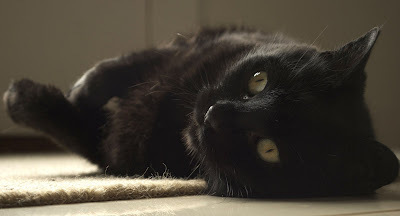 I think that the best part of being a House Panther is being black, and therefore cool. Black is the new black for this season, the fashionistas say, so we are very stylish. Also stupid people are afraid of black cats so we know only nice and smart people can be our friends. Plus, we can color-coordinate with just about anything, or any one, or anykitty or anypup. We are very versatile. 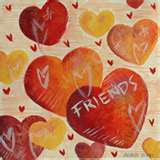 My dear friend Fin asked: If you could be any color (other than black) what color would you be? I think, Fin, that I would be purple. Purple is my favourite colour, and just think how famous I would be, being the only purple kitty in the world! I could get a full time assistant who could bring me ham and mouses on demand. That sounds pretty good to me. And my new friend Jeter Harris asked: wut hav u explored? an hav u ever climbed a tree, walked on da roof, an climbed thru da bafroom window? Jeter, I have explored the entire house, including all the cupboards and under the beds and in the shower. I have also explored my back yard (which isn't very big, so it didn't take long). I have also been over the back fence to check out the neighbour's yards, but I don't go next door because they have a dog that barks at me all the time. I have climbed a tree (the neighbours on the other side) but I haven't been on the roof because we live in a tall narrow house that is two storeys high and I can't get up there! Plus I think mum would freak out if I tried. I have not climbed in through the bathroom window because it's one of those stupid ones that doesn't open, but I have come in the kitchen window a few times. Mostly I use my cat door though, it's a lot easier because it's Huffle height. These are the last three questions I have in the Ask Huffle file. It's taken me a while to get through them but I hope I haven't missed anypup or anykitty! If you asked me a question and I haven't answered it, I'm sorry, remind me again what it was and I will answer! 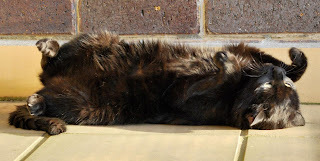 I just want some peace, laying in the sun, lazing around on a Saturday afternoon. But do you think I am allowed to do that? The pupparazzi follow me everywhere I go. There is no peace for Huffle Mawson! My dear friend Fin is having a competition to help us all join in the spirit of the Academy Awards. You can show your achievements by posting a movie, screenplay, movie review, movie poster, or [insert your idea here]. Here is my entry. I hope I win something! You can click on the picture to make the poster bigger. The Bumpass Hounds and Kitties want to know: what is a billabong? A Billabong is an Australian English word meaning a small lake, specifically an oxbow lake, a stagnant pool of water attached to a waterway. Billabongs are usually formed when the path of a creek or river changes, leaving the former branch with a dead end. The word billabong is most often heard in the Australian folk song Waltzing Matilda. Zippie, Speedy and Sadie would like to know how I got the name Huffle. I explained a couple of weeks back about how I chose mum and dad. After I got here, they spent a few days trying to figure out what my name was. They weren't fluent in Huffle speak then, so I couldn't tell them. Eventually they chose the name Stella for me. 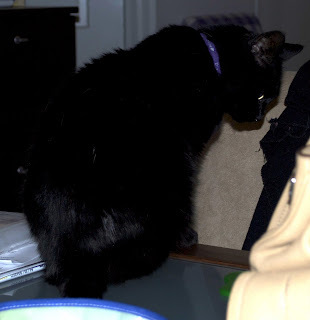 But soon mum realised that when I roamed around the house checking things out, I was huffing at them. So she started calling me Hufflepuff after the Harry Potter books. That got shortened to Huffle and so that is now my name. 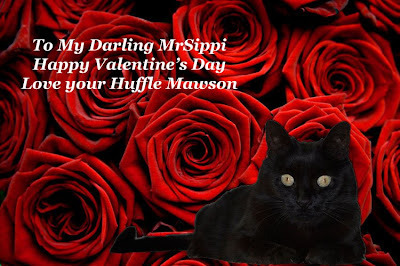 I even know that I am called Huffle and I will come running if someone says my name. Usually I hope they have some ham for me. My very nice friends the Bumpass Hounds and Kitties gave me an award last week! They have given me the Love Ya Award which is so very nice! Of course there are some rules that go with this award. I have to give this award to eight other bloggers? Okay, the first eight of my friends to comment on this post get this award! I had a question from my very good friend Wilbur a little while back. Wilbur would like to know what my favourite movie is. I think I'd have to say Stuart Little. Have you seen it? That little mouse looks so tasty, er, cute! Stuart Little 2 is pretty good as well, the mouse is still there but there's a cute (tasty) bird in it as well! Daisy the Curly Cat asked me what my favourite food and treats are. This is a difficult question because I like so many tasty things! My favourite regular food to eat for dinner every night is Fancy Feast. I like the chicken, turkey and beef flavours, and the ones in gravy are my absolute favourite. Some of the fish ones are okay but I prefer the meat. The kibble I have on tap all day is Hills Prescription Diet - I have the c/d/ and t/d varieties. My favourite snack is ham! I am not allowed to have a lot of ham but the little bits I do get are so tasty! I also like roast chicken; mum sometimes let me eat a little bit when she cooks a roast chicken. I have tried Temptations but they didn't really excite me; I preferred to play with them rather than eat them. Thanks for the questions, Wilbur and Daisy! Most of you know that my very best friend is Zim of the Army of Four. Today I am giving Zim a very special award that is just for him. He is now an Honorary Kitty Cat. Congratulations Zimmie, you are now an honorary kitty cat! A lot of you will have heard about the devastating bushfires that have been burning in my home state over the past week. Mum works for the organisation that is responsible for managing the fire fighting on public land, and she is it probably going to get a lot worse in the next week, as the weather is getting hotter and the wind is getting stronger. So far 181 people have lost their lives, and more than 1,800 homes have been destroyed. The pups and kitties who have been affected by these fires are suffering too. A lot of people now don't have a home for their pets, and are having to send them to the RSPCA for looking after. If any of you have any spare dollars you could donate, it would be greatly appreciated. You can visit this link to see what to do. 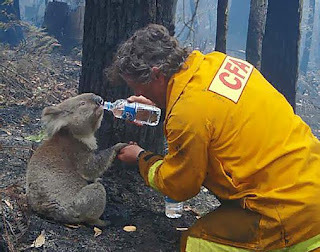 The RSPCA is also looking after the wild animals that have survived the fire - you may have seen this little koala on the news, getting a drink from a CFA volunteer after making it out of the bushfire zone. Photo of David Tree and Sam the koala courtesy of The Age. The koala had severely burned paws, which is why she is resting one of them in David's hand. She has been named Sam and is now in care with her paws all bandaged up. It is estimated it will take 8 - 9 months for her to be well enough to be released to the wild again. Victoria needs all the help it can get at the moment. My friends Cliff and Olivia asked me a question a while back. Their question: Can you get the combination for the Great White Ham Safe from the humans? Cliff and Olivia figured that since I got my very own enormous ham just after Christmas, that I would be able to help them out with their question. Well kitties, the key to opening the great white ham safe is the Harp Seal Look, as taught by my friend Stormy. In my experience, the best way to get the ham safe opened for you is to sit in front of it and practice your harp seal look. It works every time for me! 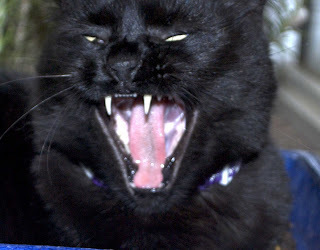 I'm putting on my scariest face for Friday the 13th. What do you think? This photo is from last Saturday. That day, it reached 46 deg C outside. That is very hot, pups and kitties, too hot even for an explorer cat. But I was determined to still lay in the sun. So I went into the garage and found this lovely sunbeam to lie in. It was toasty warm, but not as hot as being outside. And for those of you who guessed that I was up on the kitchen table the other day, you were right! Mum never lets me get up there and to be honest I've never been that interested in getting up there but that day I was sitting on mum's lap at the table and thought I would go and explore. I didn't find any ham so I probably won't bother getting up there again. My very good friend Angus Mhor asked me a question. And it's an important question for all the non-huskies out there. Angus' question was: How did you become an Honorary Husky and how can I become one, too? Angus, this is probably the hardest question I've been asked so far! There are a lot of elements to being an honorary husky, one of which is definitely having a husky for a best friend, so you can learn from them. As you know, my best friend Zim of the Army of Four is a husky and I learn a lot from him. I also learn heaps from his sister Stormy, Supreme Commander of the Ao4. For example, she taught me how not to pose for photos. That's a very important husky trait. One final thing. It also is a requirement to know and appreciate the Tube Wolf to be an Honorary Husky. I hope that helps, Angus. A couple of weeks ago, I did something I've never done before. And I didn't even get in any trouble. Can any pup or kitty guess where I am? Gandalf and Grayson had a question for me a little while ago. They wanted to know how many Evil Squirrels does it take to to make our Nana freak out when she sees them... in the hallway? The answer to that question is one. Two if the first one is in hiding. Ozzie the Ozmonster had this question: If you were a food, what kind would you be and how would you be prepared? That's a good question. I don't really think I'd like to be eaten so I would like to taste like brussel sprouts, prepared raw. Then no-one would eat me! Mum, Dad and I would like to thank everypup and kitty and human very much for the kind words about poo-face Salvador. Mum spent a long time with leaky eyes reading all the nice messages you left. For those who didn't know, Salvador was about 16. Dad adopted him as a homeless kitty when he was about one, and had him for 15 years. It was a hard decision to make but we know it was the right one. Even though Salvador and I didn't see eye to eye (mostly because he always wanted to kill me!) he was my brother and I miss him a lot. I spent a lot of time yesterday sitting by the front door waiting for him to come home. I have to get used to being a single kitty family now. Tonight, my big brother Salvador went to the Rainbow Bridge. Mum and dad had taken him to the v-e-t this evening because his health had been getting a lot worse lately. He wasn't grooming himself, he kept having accidents in the house, and two days ago he stopped eating properly. When the v-e-t examined him, he found a very big tumour on one of his kidneys. The v-e-t said that because it had grown so fast (it wasn't there six weeks ago when Salvador last went to the v-e-t) that there was nothing they could do for him, and the fact that he had stopped eating meant that Salvador was telling us it was his time. 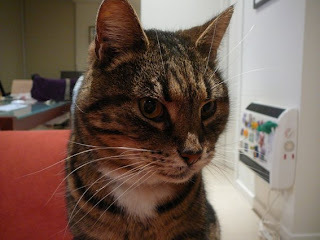 Farewell poo-face, I hope you are having fun over the bridge and chasing lots of birds. It's been a busy week pups and kitties. Mum has been walking for the Idita-Walk challenge but she hasn't bought my Huffle harness yet so I haven't been going with her. I've been doing more important things anyway - working hard in the garden! There are some strange little things in our garden. I don't know what they're called and mum has never managed to catch one with the flashy beast so I can't even show you a picture. Just know that I am keeping everyone safe in our yard, by attacking these strange little beasties when I see them. My new friend Misha in New Zealand asked me a question last week. Actually, his mum had the question. She wants to know why cats sleep so much. Misha told her that it's because we can, but she wants a better answer. Well Misha, I have done some extensive research on your question and the best answer I can find is: because we can. Other places I looked said things like this: On average, cats sleep about 16 hours a day, which equates to about two-thirds of their life. 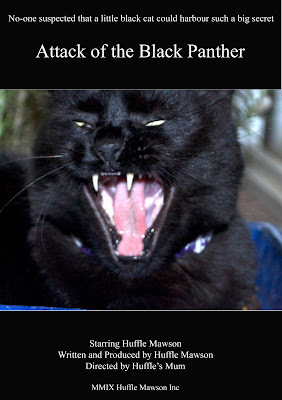 In fact, cats get more sleep than virtually any other animal, about twice as much as most mammals. Thus, sleeping is simply a normal behavior for cats. 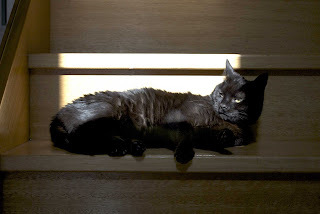 Just how much a particular cat will sleep, however, can depend upon many factors, including their age, their degree of hunger, their sense of security, the temperature and the weather. 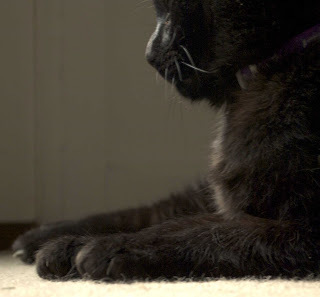 Other answers said it's because cats are most active at dusk, and that we need to sleep a lot during the day to conserve energy so we can play Thundering Herd of Elephants at night. I hope that helps your mum with her question, Misha! I hope that my boyfriendcat MrSippi is feeling a little bit better today. Maybe this photo will help him to smile. 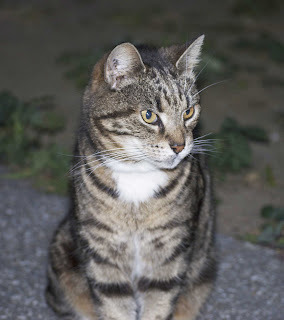 I had two questions from the Bumpass Hounds and Kitties last week. First, Boru (a VERY handsome mancat) asked me for my phone number. I'm blushing! Mum says I am not allowed to post our phone number on the interweb, but you can email me any time Boru. Second, J.E.B. asked how much wood would a woodchuck chuck if a woodchuck could chuck wood? The answer to that question is seven. An alternative answer is: A woodchuck would chuck as much wood as he could if a woodchuck could chuck wood. But it wasn't me that got tagged - it was Mum! She was tagged by the Army of Four's mum to play the 40 things about me game. She is a bit hopeless which is why it's taken so long. But I finally got the answers out of her, so here are 40 things you probably didn't need to know about my mum. She was born in Melbourne, Australia, and has lived here ever since. She went to Royal Melbourne Institute of Technology University for a degree in Information Management and Library Studies. This means she is really a nerdy librarian. Mum worked as a librarian for six years after uni, but not since then. Mum has had a lot of marketing and event management jobs in her life. Mum had never owned a cat before I came along. Mum's first dog, Buffy, was a Standard Poodle mix something, and she used to dress him up in her doll's clothes, and sleep in his bed with him. He never complained about this treatment. Mum has been to Singapore, Hong Kong, the United Arab Emirates, Oman, Yemen, Greece, England, Poland, the USA, Canada, Vanuatu, Fiji, New Caledonia, the Cook Islands, and she is going to New Zealand in March. Wait a second, I didn't know anything about this! Mum and dad met on a blind date, and have been together ever since. Mum is a very good cook. Mum does not cook for me; this is not fair as far as I'm concerned. Mum had laser eye surgery in 2007, and now has perfect vision. Mum cannot sew to save her life. It's true. She can't even put a hem up. Mum is quite a good photographer. Mum saw real live polar bears in the wild last year, and says it was the most amazing thing she has ever seen. Mum's family is all Polish. Mum went to Polish School when she was little but doesn't remember much of it. She can still count to 10 though. Mum has a serious addiction to shoes. She has 93 pairs. Mum played tennis three times a week when she was younger. Mum now suffers from tennis elbow, or RSI. Mum had a stroke when she was 22. She is fully recovered these days. Mum learned Japanese for five years at high school, but remembers even less Japanese than Polish. She can still count to 10 in Japanese though. Mum thinks 40 facts about her is a lot; isn't everyone bored yet? Mum has one sister who is 18 months younger than she is. Mum has blonde hair and green eyes; her sister has brown eyes and brown hair. Mum has never broken a bone or had a filling in her teeth. Mum switched from a PC to a Mac at home last year and thinks it is marvellous. I find it pretty good for my Huffle blogging too. Mum's least favourite type of housework is ironing. Mum can remember the phone number of every house she's ever lived in. She can't remember what to buy at the supermarket each week though - she needs a list. Mum is not a coffee drinker but dad makes her a coffee in bed every Saturday and Sunday morning and she really appreciates it, and drinks the coffee happily. Mum works for the Victorian State Government, in catchment management. This means she worries about water for all of us. Mum's favourite book ever is Catch 22, by Joseph Heller. Mum is allergic to peanuts - they cause her migraines. Mum is also allergic to salt. Mum has met a lot of people in her various jobs, and counts a former Premier of Victoria among her friends. Mum travels around the state a lot for her job. Mum's favourite colour is purple. Mum is very accident prone, and has fallen down the stairs at home, and at work. Mum is ecstatic we made it to the end of the list. 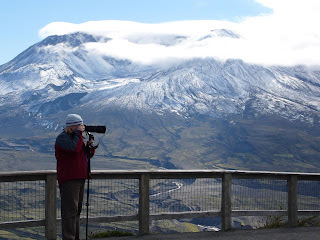 This is mum at Mount St Helens in October last year. It's a very sad weekend pups and kitties. 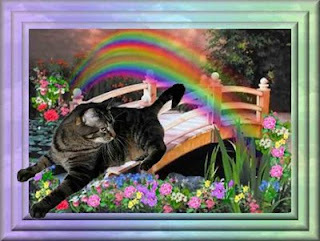 My boyfriendcat's sister Sweet Carolina went to the Rainbow Bridge yesterday. Run free Sweet Carolina. 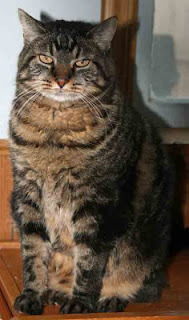 I am purring for MrSippi, Mama, Thor and Marco Polo, and their mum Jill.